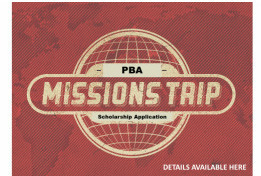 On behalf of the PBA Missions Priority Team, we give praise to our Lord as of this date we have been able to grant mission trip scholarships to 87 church members from 13 PBA churches. These churches have or will be reaching out to 9 nations including Africa, Dominican Republic, Haiti, Italy, Mexico, Puerto Rico, Panama, Ukraine, and the United States which includes Kentucky, Maine and Virginia. The PBA Mission Scholarship funds available for the 2018 fiscal year are now depleted. Unfortunately we are unable to grant any additional scholarships for the remainder of the year. Thank you for all you do to make this possible. It is a privilege to assist PBA church members as they journey on mission for the sake of the advancement of the Gospel. 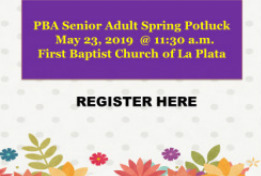 We hope that representatives from your mission teams will attend our PBA Annual Meeting on October 25 to share about their trips.